The stately stork: Stork. The word isn’t exactly poetry in motion, but there is much to admire in these graceful birds that inhabit wetlands, grasslands, and tropical forests on every continent except Antarctica. They range in size from the small hammerkop, at about 2 feet tall (56 centimeters), to the looming marabou stork at nearly 5 feet in height (1.5 meters). Some species are slate gray, while others sport white, red, and black. Storks are also beautiful in flight. They fly mostly by soaring on warm air currents, with long, broad wings that only flap occasionally. They stretch their neck out and dangle their legs behind them as they fly, making them recognizable even from far away. Some storks have bare patches on their head and neck. In the scavenger species, this is thought to prevent feathers from getting stuck together with blood or mud, but the bare places are also used to impress, becoming more brightly colored during breeding season. Some storks also use their feathers in displays, like the woolly-necked stork that has feathers to puff out around its throat like a ruffed collar. Storks have a dignified appearance, standing graceful and tall or marching deliberately on slender legs. The legs vary in shades of black, gray, or orange. Nature has a good purpose for those long legs, of course: they allow the stork to take long strides and wade into deep water or tall grasses and reeds in search of food. In some species, the legs act as a radiator to aid in cooling down the stork’s body during extreme heat; marabou storks deposit urates on their legs (in birds, urates are urine and feces combined). As the moisture from the urates evaporates, the underlying blood vessels are cooled. Depending on the species, nests can be found in trees, on buildings, among rocks, or on the ground. They are most often made of sticks and grasses. The typical platform nests sometimes reach sizes of more than 6 feet in diameter and 3 feet deep, as seen with the larger black-necked and jabiru storks. Maguari storks nest on the ground in reed beds, while those such as Abdim’s and lesser adjutant storks nest in cliffs and on rock pinnacles. For many species, a new nest needs to be made each year, but others may go back and use the same nest several years in a row. Even so, the storks always add to it, which is why some stork nests are so big. Hammerkop pairs continually add sticks and twigs to their unique domed nests, even when they have no chicks or eggs to care for. The nests are mostly made of sticks, which the male finds and brings back and the female puts in place. Some storks dig up patches of turf and place them inside the nest. Often, the male brings a leafy green twig as the finishing touch after the construction is over—the stork version of home decorating! Stork nests can be huge, more than 9 feet (2.7 meters) deep and 6 feet (1.8 meters) wide in some cases. The storks aren’t the only ones using them—small birds like sparrows, starlings, and wrens make their own nests in spaces between the sticks. If the Shoebill Fits: Shoebills were considered part of the stork family until recently. DNA studies revealed that they are closer related to pelicans. So now, shoebills are in the Order Pelecaniformes within its own family, Balaenicipitidae. Abdim’s storks are called "grasshopper birds" in parts of Africa because they feast on swarms of the insects. Since most storks live in wetlands or near water, they usually eat fish, amphibians, small reptiles, shellfish, and insects, although some also catch small mammals like rodents and moles. 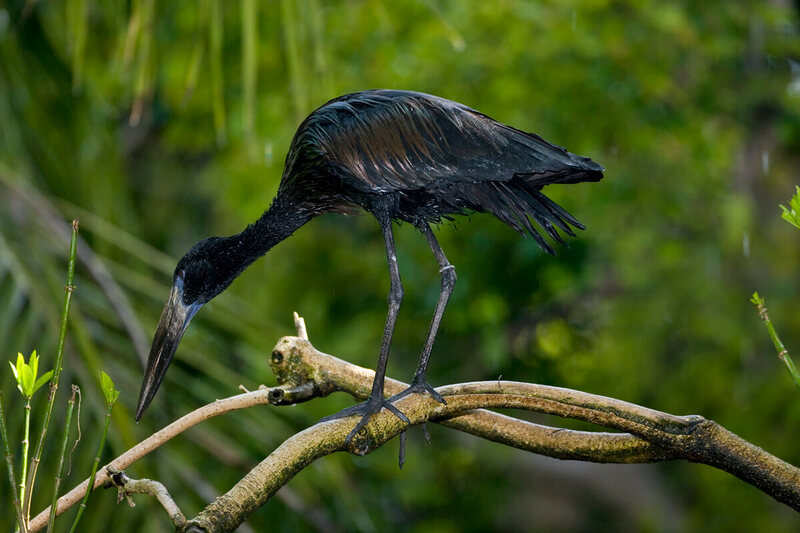 Wood storks are even known to eat snakes and baby alligators. There are variations on the storks’ feeding habits, and bill shape can sometimes offer a clue. Scavengers like the marabou and greater adjutant storks have a large, heavy, sharp-edged bill to tear meat off carcasses. Storks that feed in murky waters, like the wood, yellow-billed, and milky storks, have sensitive areas on their bill that can feel prey brushing against it. They stalk slowly or just stand still with their bill in the water, and when they feel food, they snap it up. Other species, like jabiru and maguari storks, have a pointed bill used to jab at prey in water or tall grass. The open-billed stork has the most unusual eating habit. A curved opening in the middle of the bill allows the stork to eat a favorite food: acquatic snails. People used to think the stork picked up a snail and then crushed it, kind of like a nutcracker. But when the birds were studied, the empty snail shells weren’t crushed at all. It turns out that these storks use the upper part of their bill to hold the snail against the ground, while the lower part of the bill slices the muscle holding the snail in its shell. The snail is then pulled out and swallowed, leaving the shell intact. Open-billed storks also use this nifty trick to open clams and mussels. Storks at the San Diego Zoo and the San Diego Zoo Safari Park eat a variety of thawed fish, shellfish, and mice. When it comes to nesting, storks may be either colony nesters or solitary nesters. Colony nesters: These storks gather in large groups, from a few pairs to several thousand birds. They often share their breeding grounds with other species. In Africa, it’s not unusual to see large colonies of Abdim’s, yellow-billed, and marabou storks mixed in with pink-backed pelicans, herons, and egrets. It’s quite a party! Solitary nesters: Jabiru, black-necked, and Storm’s storks form a male-female bond that can last for many years, and nest by themselves. The pair often uses the same nest over and over again, freshening it up with sticks and mud each year. Breeding seasons vary among stork species, depending upon the range and the diet, because they revolve around the available food supply throughout the year. For example, insectivorous Abdim’s storks breed during the rainy season when locusts and caterpillars are most abundant; marabou storks breed in the dry season when carrion, their main food source, is plentiful around drying water holes. When stork chicks hatch, they are almost naked, but they quickly develop a covering of fluffy down feathers. They are altricial and need their parents to care for them, so both parents are kept busy flying back and forth to bring them food. Chicks can eat up to 60 percent of their own body weight per day. If you weigh 100 pounds (45 kilograms), that would be like eating 60 pounds (27 kilograms) of food every day. Burp! After about three or four weeks, the chicks start to stand up in the nest and flap their stubby wings. After a few months, their flight feathers start to grow in, and they learn to fly. Even then, they are still dependent on their parents for food for several weeks before they start fending for themselves. Despite their long neck, storks lack muscles in their syrinx, or voice box, making birdsong impossible. But they are far from silent: they make low grunts and hisses and loudly rattle and snap their bills. During breeding season, storks do a lot of bill clacking, a courtship behavior in which they rattle the two halves of their bills together repeatedly and loudly. The legend about storks bringing babies got started in Victorian times. When a child asked, “Where did I come from?”, the parents simply said “The stork brought you.” This tied in nicely with the fact that European white storks often nest on the roof and chimney of houses in the spring, a time when many babies are born. The bird became a symbol of fertility and is considered good luck. Storks have been a part of San Diego Zoo Global’s bird collection since our early years, when we started with marabou and jabiru storks. Today, between the San Diego Zoo and San Diego Zoo Safari Park, we have 10 stork species represented in our collection. The Storm’s storks are the rarest we have. It was a great honor when Malaysia’s Zoo Negara sent us two pairs of Storm’s storks in 1994 with hopes that we could successfully apply our stork-breeding expertise to these rare birds. In 2001, when the storks matured, we welcomed four chicks from two different clutches, the first breeding of this species in North America. We do everything we can to replicate our storks’ natural habitat. Our care techniques are always improving as we strive to meet the birds’ needs. 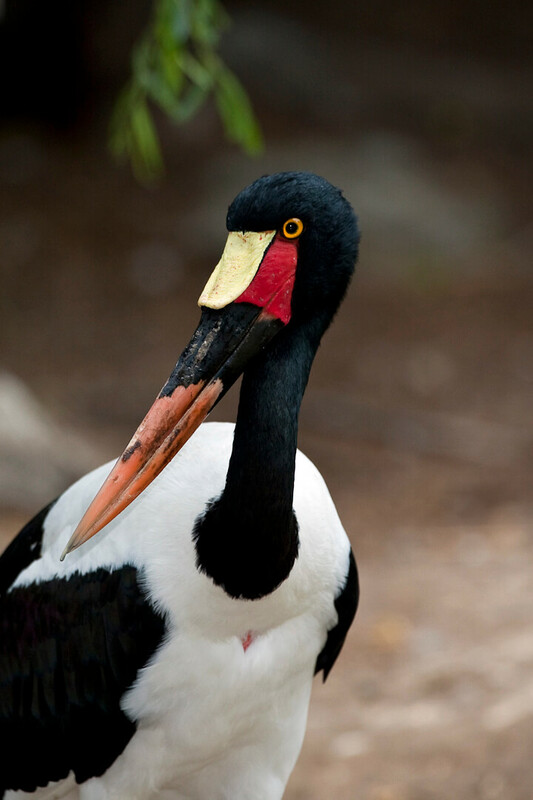 The Safari Park is one of only four zoos in the country to breed saddlebill storks. 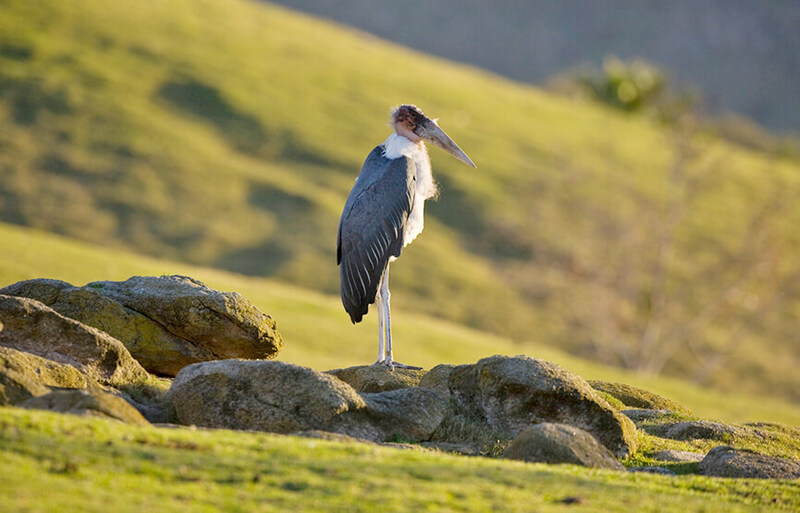 In June 1994, the Park became the first zoo to breed the African open-bill stork. The future for storks is precarious. Stork populations are decreasing in numbers because of habitat loss, pesticide usage, and poaching. Storks are diverse and unique, and they are dependent on marshlands for their survival. As they are so recognizable, they are an excellent flagship group of birds. Saving stork habitat will also protect other flora and fauna that use the marshlands. A marabou stork’s bill grows all its life and can be 13.6 inches (34.6 centimeters) long. The large, heavy bill is a formidable weapon against other scavengers, even hyenas and jackals. Frogs are a main food source for European white storks. The frogs are attracted to the stork’s red legs. Abdim’s storks and European white storks are called "grasshopper birds" in parts of Africa because they feast on swarms of the insects.